Today, we celebrate the Solemnity of the Most Sacred Heart of Jesus. 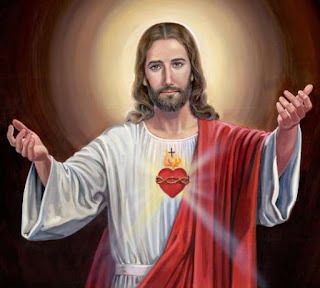 Drawing on the day’s readings, Pope Francis described the Solemnity of the Most Sacred Heart as the “feast of love”: “Jesus wanted to show us his heart as the heart that loved so deeply. This is why we have this commemoration today, especially of God’s love. God loved us, he loved us with such great love. I am thinking of what St Ignatius told us.... He pointed out two criteria on love. The first: love is expressed more clearly in actions than in words. The second: there is greater love in giving than in receiving. These two criteria are like the pillars of true love: deeds, and the gift of self”. Explaining further, the Holy Father dwelt on the two aspects of God’s love which the day’s liturgy unveils to us. The first was God’s love symbolized by the shepherd: closeness. “The shepherd close to his flock, to his sheep that he knows one by one”. With regard to tenderness, the second aspect of God’s love for us, Pope Francis said: “the Lord loves us tenderly. The Lord knows the beautiful science of caresses — God’s tenderness. He does not love us with words. He approaches us, and in being close to us gives us his love with the deepest possible tenderness”. However, “more difficult than loving God is letting ourselves be loved by him”, the Pope concluded. “Lord, I want to love you but teach me the difficult science, the difficult habit of letting myself be loved by you...”. Perhaps this is what we should pray for at Mass. When we hear the name, “Most Sacred Heart of Jesus,” most of us probably think of a statue that appears in many of our churches: the image where Jesus stands with his heart, burning with joy and love for us, exposed to all. Many of us probably do not think any deeper about this statue, and yet we are called to more. Pope Francis said, “It is more difficult to let God love us than to love Him! The best way to love Him in return is to open our hearts and let Him love us.” Every time we see these statues we are reminded to open ourselves to the love of Christ and give ourselves completely to him as he does. He lays his heart open before us as an example of how to live our lives.